I recently finished reading a book called Mr Briggs’ Hat by Kate Colquhoun, “a sensational account of Britain’s first railway murder”. In fact the subtitle isn’t particularly apt because this is a sober yet fascinating account of a famous Victorian crime, the investigation and trial that followed it. It’s a gripping story because it involves not only the elements of the classic “locked room” murder mystery, but also the pursuit of the suspect across the Atlantic to New York. I won’t describe the story in full, as the details can be found in many places on the net. In a nutshell, the victim of this crime was a 70-year old well-to-do banker by the name of Thomas Briggs, who was found lying on the tracks of the North London Railway, between Bow and Hackney Wick (also known as Victoria Park) stations on the evening of 9th July 1864. He was carried to a nearby pub, but died later that evening of extensive injuries to the head. Briggs had boarded a first class compartment of the 21.45 train from Fenchurch Street station in order to travel to his home in Hackney. When the train had arrived at Hackney Central, at 22.10, one compartment, with nobody inside, was found to be covered in bloodstains; an empty leather bag and a walking stick were also found. It wasn’t hard to put two and two together; some of Briggs’ possessions were found in the compartment, as was a battered hat. 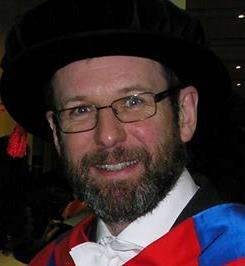 After Briggs’ death his family were asked to identify the various items that had been found, which they did, apart from the hat, which wasn’t his. Mr Briggs’ own hat had vanished. All the evidence suggested that Briggs had been violently attacked and then thrown from the train. Perhaps he had tried to defend himself and in the course of a struggle had knocked off his assailant’s hat. In the rush to leave, or perhaps because his own was damaged, the murderer must have picked up the top hat Mr Briggs had been wearing. Briggs’ watch had apparently also been stolen. After many false leads and a great deal of frustration the police finally developed a plausible suspect, an impoverished German tailor by the name of Franz Muller. Muller had apaprently been trying to raise money in order to travel to America and had in fact already boarded a ship to make the Atlantic crossing by the time the police were on his trail. However, Muller had travelled the cheapest way possible, on a sailing ship, steerage class. Detective Richard Tanner, who led the police investigation, realised that if he travelled on a faster steamship he could still get to New York before Muller. So off he went, with a number of key witnesses in tow so he could produce them at an extradition hearing. This was all at the height of the American Civil War, incidentally, but the Muller case still made front page news in New York. Anyway, Tanner secured the extradition warrant and returned to England with Muller, who was committed for trial at the Old Bailey and held on remand at Newgate. The trial lasted only three days, and it took the jury only 15 minutes to return a verdict of guilty. Muller was hanged at the public gallows at Newgate on November 14 1864. A huge crowd turned out to watch and there was so much disorder that the police feared a full-blown riot would break out. Such was the concern about this event that within a few years the practice of public executions was discontinued. One of the reasons for the unrest at Muller’s execution was that there was a public outcry about the result of the trial. Many questions that had arisen during the trial had never been satisfactorily answered and Muller had continued to protest his innocence. He claimed that he had obtained the hat himself at a second-hand shop and had bought the watch in a similar fashion down at the docks, where stolen goods were regularly flogged. The law of the time, however, considered defendants on murder charges (and their spouses) to be “incompetent witnesses”, which meant that they were not allowed to take the stand in their own defence. Muller was therefore never given the opportunity to give his own account of what happened that evening. He had an alibi, in fact, that he’d spent the evening with a ladyfriend so she was called as a defence witness. It turned out however that she was a prostitute, and therefore lacking in credibility to a Victorian jury, and was also profoundly deaf. The prosecution tore her to shreds on the witness stand. The compartment in which the crime took place was a mess, with blood spatter and general signs of a disturbance. Why then did nobody else on the train hear anything? And how did Muller avoid getting any blood on his own clothes? A poor man like Muller would not have an extensive wardrobe, and his landlady (who also washed his clothes) hadn’t noticed any bloodstains on the night of the crime, or in the days afterwards before Muller left for New York. And how did he get off the train? Nobody saw him at Hackney station. Did he jump onto the tracks? Another important question was raised at trial by a railway employee who had noticed Mr Briggs, a regular passenger on the North London railway, on the train at Bow station in a first class compartment with not one but two other men, neither of whom matched the description of Muller (who was short of stature and of slight build). The prosecution rubbished this testimony too, but it turns out that the police had found four other witnesses who had seen the same thing: Briggs in his compartment with two other men. In those days, however, the police were not obliged to disclose evidence to the defence if it was not used at trial. Had five independent witnesses all delivered corroborating testimony then there might well have been reasonable doubt about Muller’s guilt. Above all, Muller just didn’t seem to behave like a murderer. He had told his friends well in advance of his departure for the United States, and had travelled in his own name without any attempt to conceal his identity. He was mild mannered and polite, on the small side, and not at all what the public expected of the perpetrator of such a violent crime. He was also quite small. Was he really capable of beating the much larger, if older, Briggs to death and then heaving his body out of the train all on his own? All the evidence against Muller was circumstantial. No eyewitness put him on the train that night in 1864 and there was no forensic evidence to connect him with the crime scene. There was a bloody thumbprint on the hat left at the scene and a bloody handprint on the carriage door, either of which could have been conclusive, but decades were to pass before fingerprint analysis was to become an established part of forensic science. DNA or other trace evidence could of course also have been used to determine whether any of the blood in the carriage was Muller’s or even if he had worn either hat. And what was Muller’s motive? Contrary to the suggestion that he was looking for money to allow him to move to New York, he seems to have had enough money already to pay for his ticket, because he had already bought it when the murder happened. It could have been an impulse. Perhaps he saw Briggs, who was wont to doze off on the train, and attempted to rob him but woke him up and a struggle ensued; but this seems very out of character. 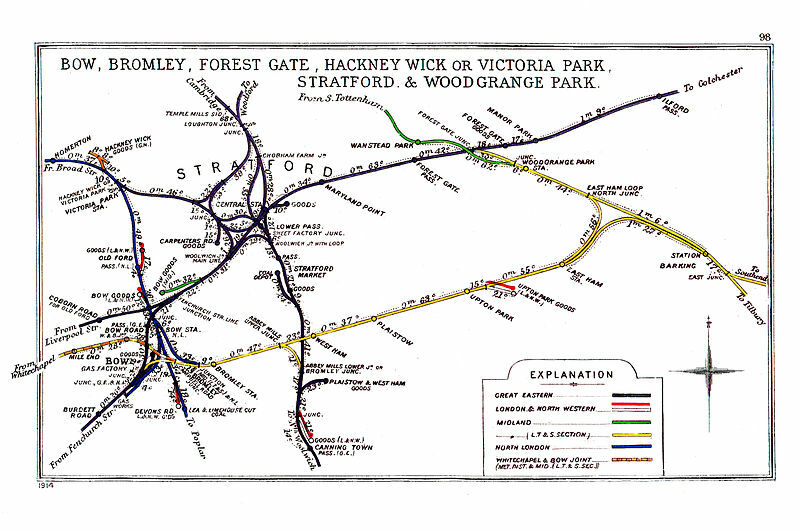 The line extending out of the top of the map is the route taken by the North London Railway at the time, essentially up the eastern side of Victoria Park, passing through Old Ford, before turning to the west to arrive at Hackney. So what happened to this railway and all its stations? Well, if I tell you that they were all closed to the public in 1944 then you can probably guess. This part of London was heavily bombed during the Second World War, and not only during the Blitz. In fact Bow Station was hit by a V1 flying bomb and damaged beyond repair, but that was after operations on the North London Line had already been suspended because of bomb damage. You can find a huge amount of fascinating detail about the disused stations on the North London Railway and elsewhere here.